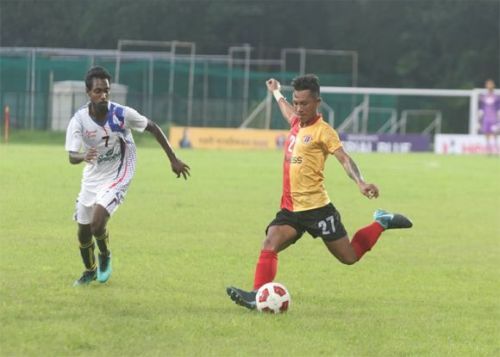 Red and Golds' winning run in the Calcutta Football League – Premier Division ‘A’ ended with a goalless draw on Friday at the East Bengal club ground against Calcutta Customs. East Bengal was playing their 134th Premier League Match today, against Calcutta Customs. The Red and Gold fans were expecting an exciting game to witness but the performance of their beloved team was not up to the mark. In the pre-season friendly, Customs lost to East Bengal 1-2 but today they became able to hold the Kolkata Giants with their tactical football. A lot of chances were created from the very beginning of the match, for both the teams. In the 13th minute of the match, a pinpoint cross came from Samad Ali, but Lalrindika Ralte's header went wide. In the 26th minute, Customs created some space for themselves upfront but Eze Stanley's casual approach resulted in the opportunity going from their hand. In the 39th minute, Lalrindika fired in a venomous volley from close range, Shubam made a spectacular save in some fashion. All witnessed a dominating performance from East Bengal in the first half of the match but it was not enough to trouble the scoreboard. At the half-time, substitutions were made by both the teams as for Customs, Sourav was replaced by Arijit and for East Bengal, Bidyasagar and Kamalpreet were replaced by Al-Amna and Brandon respectively. In the second half, a couple of good opportunities were created for the Red and Gold brigade, but they missed those fishily. In the 68th minute of the match, Lalramchullova's header went wide from a cross delivered in by Lalrindika Ralte and in the 74th minute, Suvam misjudged the floated freekick from Samad Ali, Kingshuk headed it wide. East Bengal fans became upset when a great opportunity was created for them but Bali Gagandeep's attempt from point-blank range was cleared off the goal line. Today, it just was not East Bengal's day. Eight minutes of extra time were added at the end, which is quite rare, but those extra minutes were not enough for both the teams to put at least one goal against their rivals. The East Bengal players were still trying hard to find the way to goal. In the last minute, Surabuddin's long throw found Brandon, who headed it over the goal. All he had to do is to guide the ball into the empty net to get their desired goal. The keeper of Calcutta Customs, Subham got the player of the match award for his great performance as Calcutta Customs held the mighty East Bengal by goalless. After the game between East Bengal and Calcutta Customs, East Bengal secured the second place in the points table with 4 points from 2 games, following their arch-rivals, Mohun Bagan.